Set aside some quiet time to visualize your desired outcome. Turn off your phones, log off of the computer, and sit quietly with only a piece of paper and a pen. What does achieving your resolution look like? How will you know you have reached your goals? How will you feel when you get to where you want to be? There are studies that show simply thinking positively about your goals is not enough. Visualize your goal again and this time think about the potential obstacles that stand in your way. Write down everything that pops into your head, no matter how trivial it may seem to you now. Don’t worry about trying to solve these problems right now, just get it all out. For example, is your family supportive of your goal? Do you have everything you need to reach the goal (e.g. money and time)? Will you need more information or education before you get started? What makes this goal so SMART? What is the result you want to attain in the end? What is the most important thing that you want to work on? If you meet your goal, how will your life change? You will be more successful in reaching your goal if you develop a support network that will keep you accountable. This is a big role that I play with my clients, providing accountability and support during one-on-one coaching sessions and also on my online journaling platform. Do you have friends or family members with whom you could discuss your goal? What forms of support do you think would be most helpful? Do you anticipate that your friends or family members may interfere with your goal? SMART goals are reasonable and realistic to achieve. If your goal has you losing more than a pound or so every week, then it may not be attainable. (See my blog post on how dieting math is steering us wrong). Also, if you’re making a goal to lose weight by making big changes or a lot of small changes all at once, you may not be making an attainable or realistic goal. Do you need additional resources to be successful? How will you obtain these? Are the goals realistic given your current physical capacity, resources, emotional state, and support? On a scale of 1 to 10, how confident are you that you can attain your goal? Setting a finish date for your goal will give you a point to look forward to and limit the risk of procrastinating of beginning or prolonging the process unnecessarily. When do you think you can realistically reach the goal? How long will it take you to reach this goal? 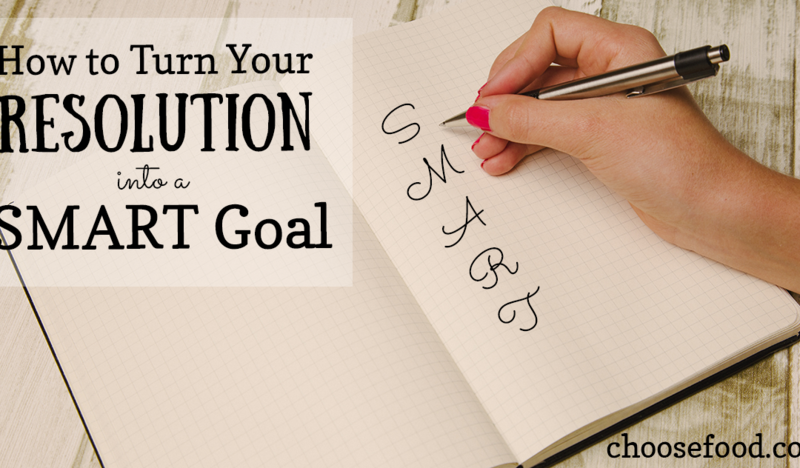 Write down your SMART goal in your journal, but also in a place that you will see often (a card in your wallet or pinned on the wall). 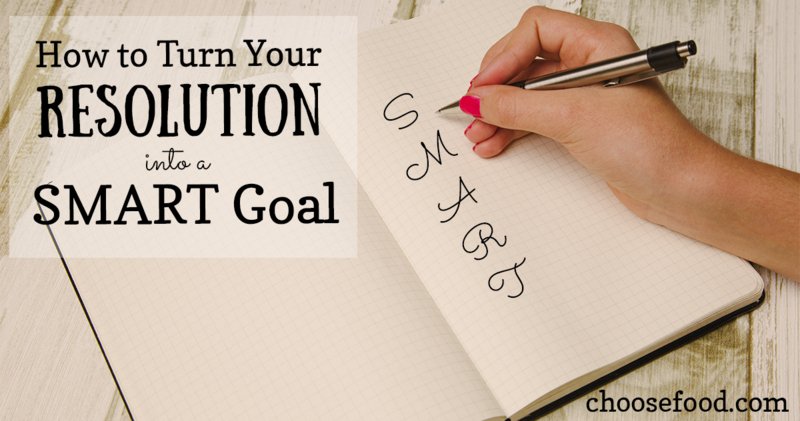 Not quite sure if your new, powerful resolution is SMART? Share it in a comment and I’ll help you out!